Homepage. This page: Open cab van & truck versions of Ford's Model T, the 'tin lizzie'. 1. Rare photo of a commercial Model T Ford. The stock of original old-car photos is piling up nicely on oldclassicar, including this one sent in by Les, a regular contributor to this website. To view more photographs like this one, please visit the main photos of old cars section. Thanks for scanning and sending this over Les. 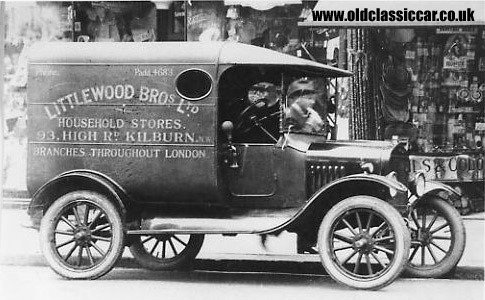 The van in question is liveried in the colours of Littlewood Brothers Ltd, of 93 High Rd, Kilburn in London. Commercial vehicles back in the 1920s and earlier offered little in the way of protection for the unfortunate driver, and passenger if there was one. 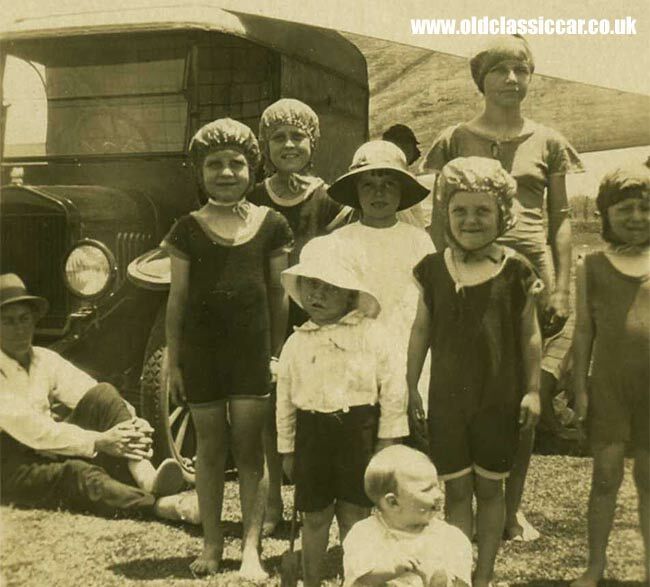 There are no side windows in this Model T Ford, so sturdy waterproofs were the order of the day when driving these little Fords. 2. Model T van photographed in New Zealand. 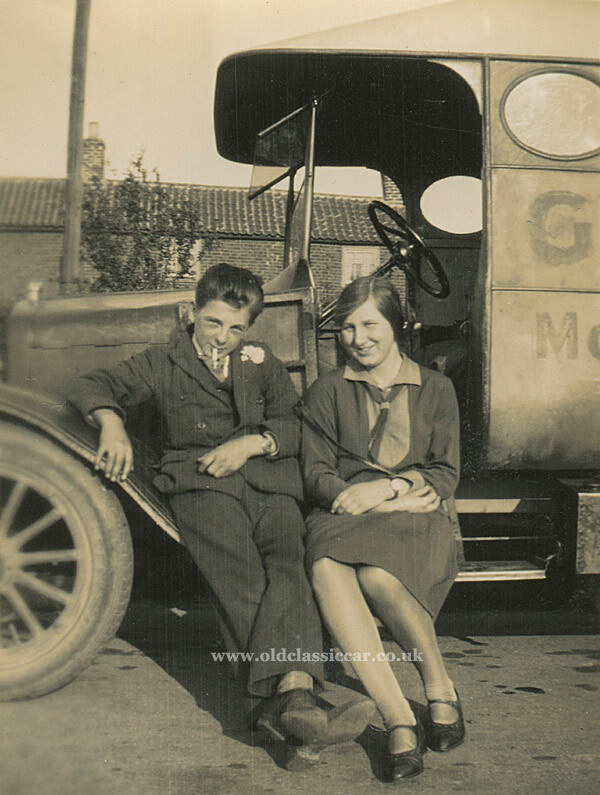 "This is a photo of my father taken in early 1920s, when he was the delivery boy for my Grandfather's store at Ohoka near Christchurch in New Zealand. I believe it to be a Model T Ford delivery van." Thanks for sending this family photo over, much appreciated!! 3. A family day out in a Ford Model T.
Sadly I know nothing about this old photograph, other than that it shows a Model T, similar to the one at the top of this page. My guess is that the family piled in the back of the van, perhaps on some makeshift seating. The bonnet is up, so perhaps they are letting the engine cool while they sup on a refreshing cup of tea, all very civilised. Note the blanket or sheeting covering the rear wheel. 4. A Model T baker's van. 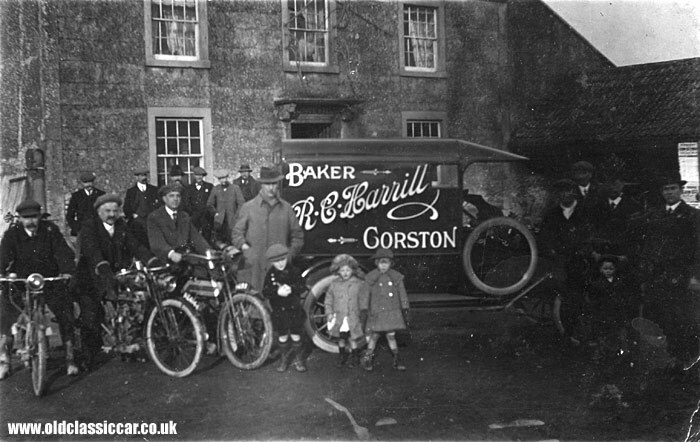 Brian sent this old family photo over, it shows a baker's van parked outside a pub in 1915. 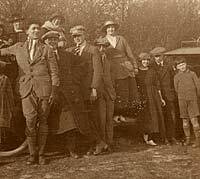 Brian adds: "The photo shows my wife's great-grandfather Robert Harrill's breadvan (a Ford Model T?) outside the Wheatsheaf pub in Corston, nr Bath. Also in the photo, it is said, are the three Douglas brothers on their motorcycles, the brothers being famous for founding the Bristol company which produced Douglas motorcycles for many years. We don't know what the occasion was or why the photo was taken. We have failed to find a clearer photo. It is said in my wife's family that the van had to be bought when it proved impossible for Robert to replace his deceased horse, all fit horses being shipped to the front in France. We have another photo of the same van outside another local pub, the Globe in Newton St Loe. Robert's son, who used to make the deliveries, was known to like a drink". Thanks for sending the photo in Brian. Dane has had a look at this photo, and agrees on the van being a Model T: "The wheels look right, the spare tyre appears to be a beaded edge one of the right size. There is just a hint of the flywheel housing under the car in the right place. Steering column is about the correct angle - pity we cant see a little more of the steering wheel as that would be a certain way to be sure. Assuming it is a T (and I'm pretty certain it is) then 1915 sounds about right. The side lamp is of the 'round' type and for 1915 only, they had a brass chimney top and brass front lens surround. This could well have a brass top. Even allowing for reflections etc, the topmost part appears to be lighter than the black body of the lamp. Everything about the vehicle suggests it is fairly new, so the 1915 date of the photo seems pretty good to me. If it can be proved that the motorcyclists are the Douglas brothers, then it is a very exciting find". Thanks Dane for the extra information! 5. 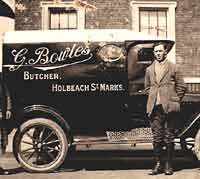 A Model T butcher's van. 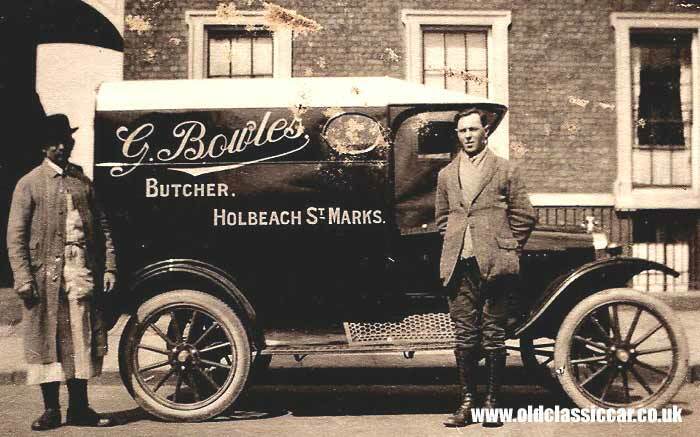 Following on from the baker's van, now a Model T Ford butcher's van, in the livery of a small firm in Lincolnshire. 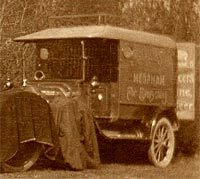 I'm told that this van is no later than 1917, and that the fitment of electric sidelamps on the front wings was an unusual choice at that time, kerosene lamps below the screen being the more common fitting. 6. Sat on a van's running board. A lady, and a young chap who appears to be puffing away on a roll-up, are shown sat on a Model T's running board/step in this next old photo. Who/what/where/when isn't known, though with him wearing a suit and having a flower in his lapel, suggests that a wedding visit might be on the cards. This shot came with a small collection of British photographs, so could well be from this country - the building in the background looks right, with curved tiles on its roof. Numerous oil spots on the ground, point to vehicles regularly being parked in this location! 7. 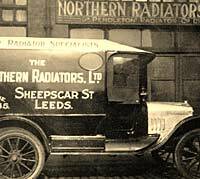 Northern Radiators Limited (Leeds). 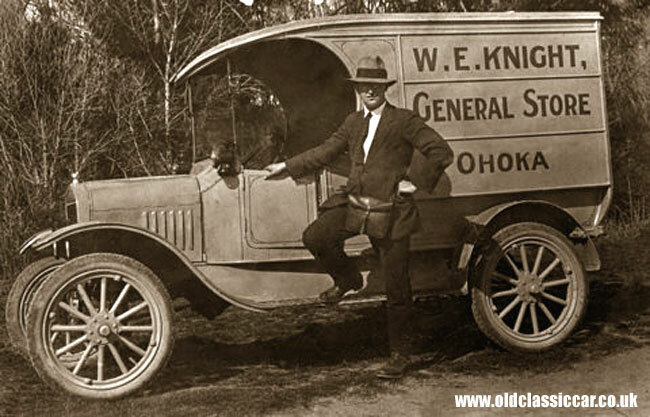 Nick, at Northern Radiators Ltd, dropped me a line and sent a small scan of the company's original Model T delivery van. A higher-resolution version swiftly followed, and with their permission (thanks) I'm reproducing it here. 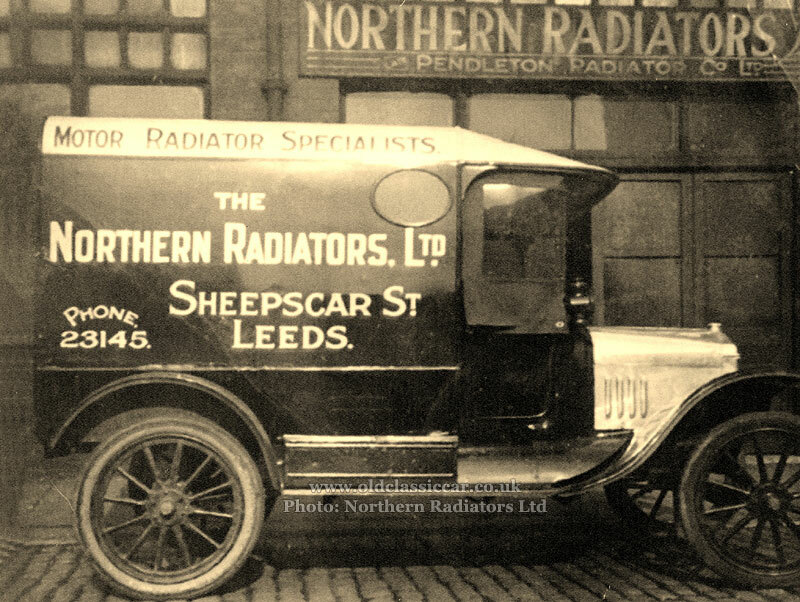 The photograph was taken outside the company's first Sheepscar Street premises in Leeds, from which the company traded between 1920-1928 and authenticates the photo's age. It's a great-looking van, and interestingly the bonnet appears to be in bare metal, and matches the shine of the Ford's nickel-plated radiator. 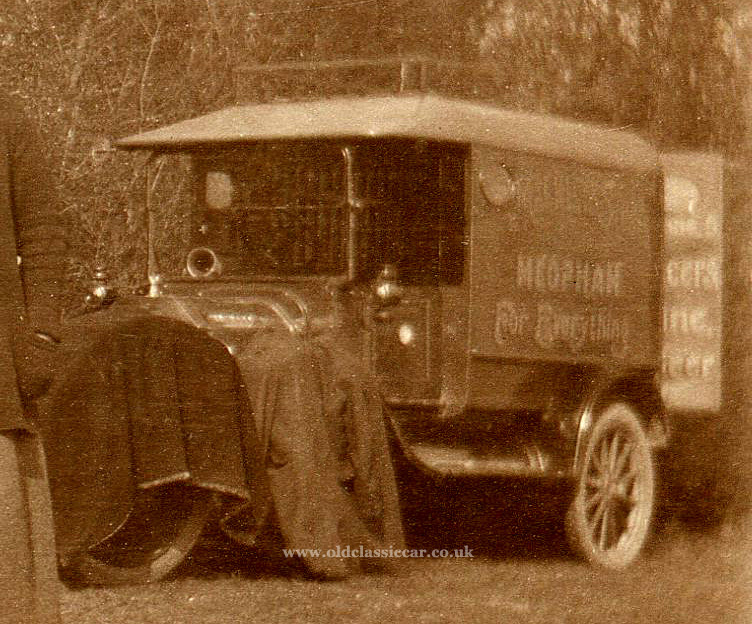 Period photos of vans rarely show the clip-in sidescreens fitted to the cab, which makes this image especially interesting. Visibility was very limited with them in place, but would have been a godsend on a miserable rainy day in Leeds. John emailed over this great picture. 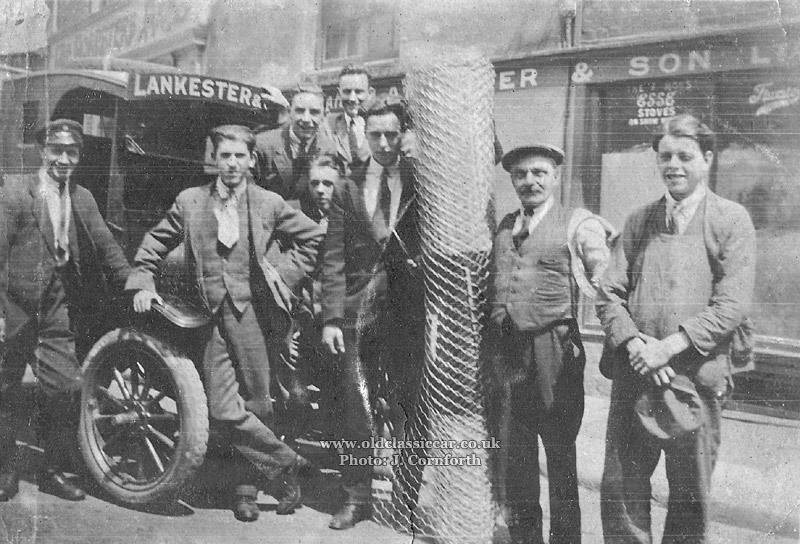 The location is outside one of Lankester & Son's premises in Southampton, in about 1926. Not much of the vehicle is visible, but it's probably a Model T (or perhaps a TT) flatbed. 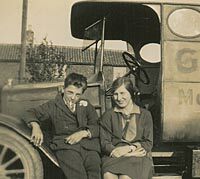 "The photo was taken some time around 1926 outside one of the Southampton shops of Lankester & Son, a long established firm who dealt with a wide range of ironmongery and engineering supplies. The firm carried on in the engineering and steel supply business until only a few years ago. 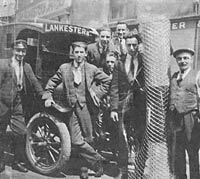 My Grandfather Frank Cornforth is on the left wearing a peaked cap, he would have been aged about 37. I don't know who the rest of the merry band were. I'm more of a car man than a commercial expert, but to me the vehicle looks like a Ford Model T, probably a flatbed truck rather than a van given the size and weight of their goods. A couple of years later it was replaced by a Dodge one-ton truck, one of the first in Southampton. My father Ken (now 90) remembers travelling around in the front seat of the Dodge when aged about 4, with his dad driving. They would visit some of the posher addresses in Southampton and the New Forest, delivering lawnmowers and suchlike. At one of these places Frank was given a penny "for the little girl". Ken had long blond curls at the time, but a penny was a penny so he kept quiet!" The photo - and the accompanying story - are brilliant, thanks for getting in touch. 9. 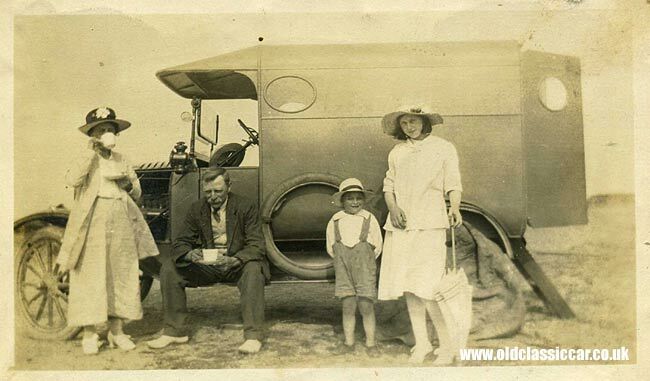 A family with their van in 1920's Kent. The following two images were plucked today from my own collection of previously un-published photographs. Who the people are isn't recorded. 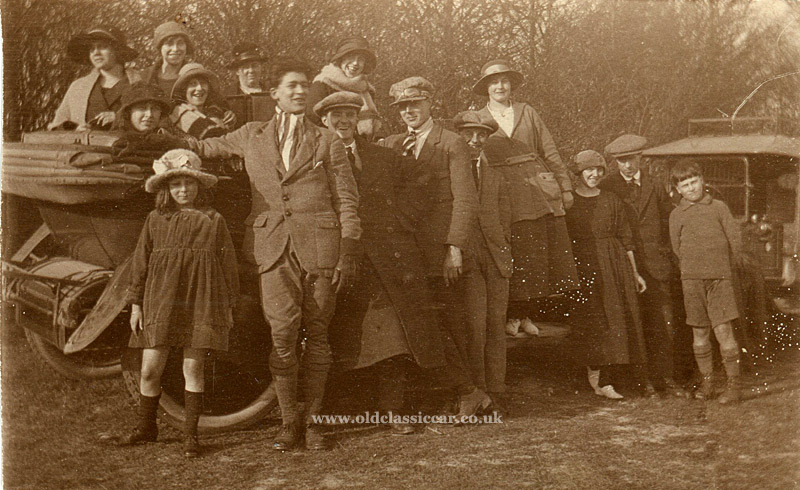 Handily though, someone thought to write on the reverse of both photographs the location (Birling Hills, which is in Kent), and also the date - April 2nd, 1923. Clearly this was a gathering of friends and/or family members, out for a picnic. 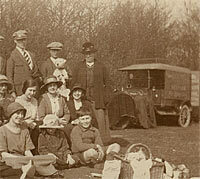 Two vehicles are present in the photographs, a large vintage tourer of some kind, and the Model T Van. In the first image, the van can be seen parked some distance away from the group. A rear door is open and two blankets are draped over the front wing. There is also evidence of signwriting on the van's sides. There is a name, that I can't make out, and then a village name - Meopham - which also happens to be in Kent, a few miles to the northwest of this location, Birling, followed by the words "For Everything". Who the trader was that owned his van in Meopham I can't make out. 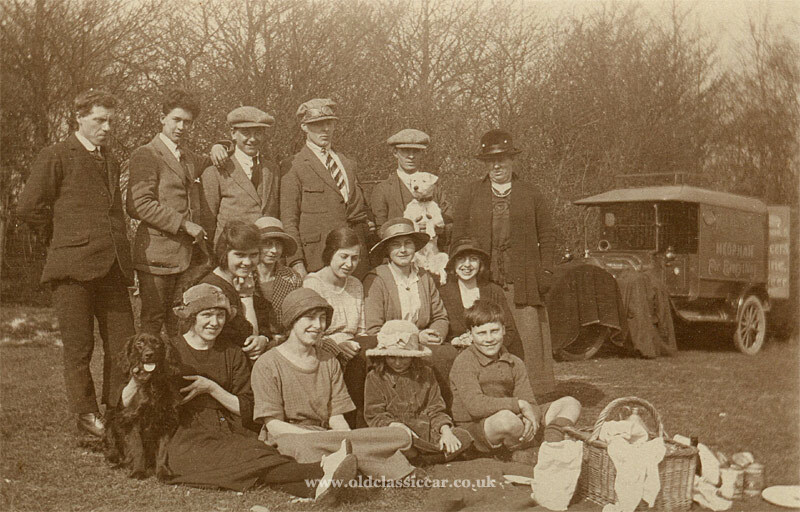 Maybe someone from the area recognises the people shown in this 1920's photo? I can see "cers" written on the rear door, so perhaps the owner ran a grocer's shop? The people's attire is a great study of how anyone with a 1920's motor-car should dress, with wide flat caps, smart ties and various tweeds in evidence. They look to be enjoying themselves, as do the two dogs that are also in attendance. The van is also just visible in the second of the photos I have. 10. Further Model T & TT photos from my own collection. The following pictures are published elsewhere but fit in well with the topic of this page. 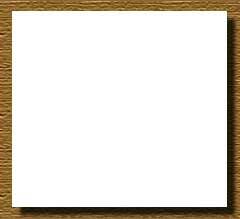 Click on a thumbnail to see a larger version. This picture shows a Model T with an unusual style of coachwork - similar to the Canopy Express that was available in the 1920s. Note the 2 gallon Shell Motor Spirit fuel can on the running board. A note on the back says that the pic was taken on the shores of Lake Hakuru, which is in Kenya. Interestingly, this is the big brother to the Model T - namely the Model TT, a purpose-built commercial based on the Model T design. To see a larger version of this Ford Model TT pic, and other 1 ton trucks like it, please visit this page. 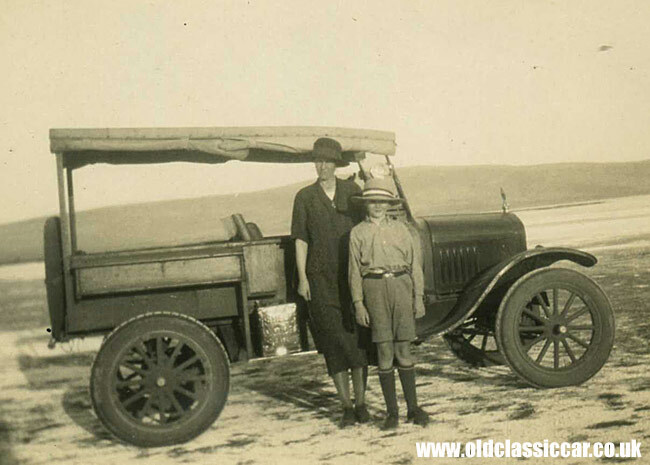 In the background of this photo is a Model T delivery van, or possibly a Model TT, with what looks like a sun awning attached to the roof, offering some shade to the people in view. 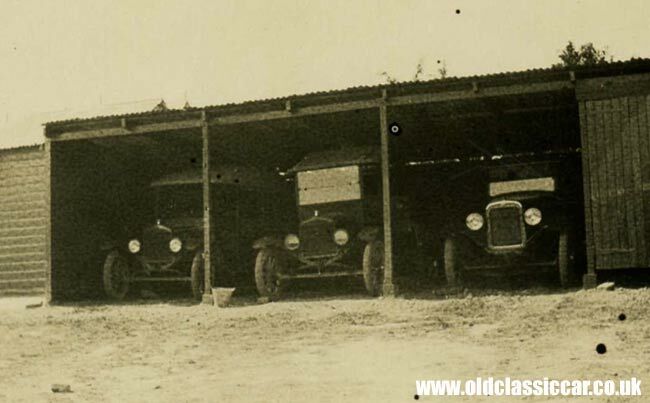 Two Model T Fords plus another vehicle are visible in this picture, which shows the three vehicles parked in an open fronted shed.